I was born in India in 1958, coming to England in 1962, and settling in Nottingham which is still my home base. As a boy, I enjoyed David Carradine’s "Kung Fu" and this led to a fascination with with Martial Arts. As a young teenager, Bruce Lee became famous, and being an avid watcher of his films engendered a desire to emulate this very popular figure. Training in the back garden, including Yoga then led to me joining various clubs ,received a background in Karate and Kung Fu, before finally realising that Taekwondo was my forte! This is still my most beloved Martial Art, but my knowledge and skill has now encompassed Kung Fu, Kick Thai Boxing, and Kuksool- won, with another speciality - Self Defence. Meeting with Doctor Lee Keun Tae in 1982, fired my enthusiasm for a full time centre of my own, as he had previously been teaching at several leisure centres around Nottingham, and also at Trent Polytechnic (University now) since 1976. Teaching was taking up most evenings and weekends, and had to be tailored around my full-time career. In 1983 my dream was finally realised. 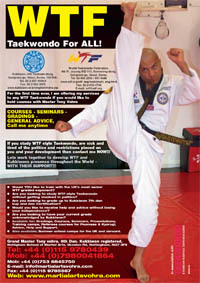 A suitable build- ing became available, and after much refurbishment the "Nottingham School of Taekwondo" in its own full-time centre, was born. Up to this point I had already achieved some fame competing in local and national competitions. This culminated in being selected for the World Taekwondo Federation Championships in Stuttgart, Germany. Sadly, at this time, 1979, students were forced to finance themselves. My subsequent Marriage and the purchase of my house meant that I was unable to attend. I did however, compete in Neinegan in 1980. Between Neinegan and the opening of my own full time centre, I also taught the East Midland Universities Officer Training Corps the skills of Taekwondo, Self-Defence and Unarmed Combat. 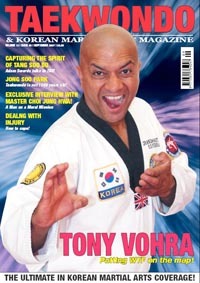 Many people will have heard of me "Grand Master Vohra" through the extensive Press Coverage he has received, including appearances on "Pebble Mill", "TV-AM" "Breakfast - Time" and numerous other programmes, including local and national radio and TV. Much coverage has also been given to my teaching of the Disabled, Senior Citizens and Ladies and my charity work. I have been noted for my contributions and articles in dedicated Martial Arts magazines, and have been extremely fortunate in my receipt of sponsorship from many local business people. I continually strive to better my skills and those of his students, and this includes regular trips abroad for competitions and seminars, both on my own and with those students who wish to accompany me. In recent years, I have been as far a field as Korea, China and South Africa, the Far Eastern countries to participate in international competitions and demonstrations. I also made an extra visit to Korea to gain my International Master Instructors Certificate back in 1998. I also competed in the World Championship in 1998 and 2000 (these events are held every two years), successfully bringing home many 1st place trophies - which also acts as a great incentive for my students. I continue to take part in, and organise demonstrations, locally, nationally and inter- nationally, and thereby hope to spread the world of Martial Arts, its meaning, and its benefits to everyone. Currently, I reside in the "Robin Hood Country" of Nottingham. My family all participate in Martial Arts. I am opening more clubs around the midlands, and will be going further afield shortly. Our international clubs include Thailand, South Africa and Ethiopia. I have always believed that anyone and everyone can achieve what I have, provided they have the determination and ambition. To be part of my winning team - join Grand Master Vohra’s Academy today! Reshape your future, and gain a positive outlook on life. Your dreams of becoming a National or international expert, and improving yourself - are only a phone call or click away!